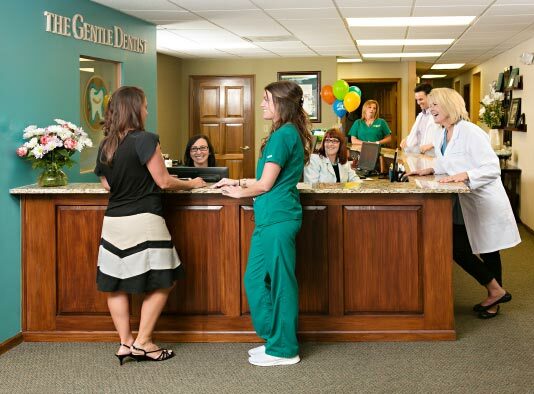 The Gentle Dentist isn't just a name we go by — it's a philosophy we live by. Also known as Coulman Dental, The Gentle Dentist is committed to making visiting the dentist an experience our patients actually enjoy. As a Columbus family dentist for more than 20 years, we've helped thousands of patients achieve beautiful smiles and the best possible dental health. Through gentle, friendly family dentistry and special touches, like massage chairs and cable television in every room, we've been helping patients feel comfortable in the dental chair for more than two decades. We make a special effort to take care of the apprehensive dental patient. Our entire staff works to put you at ease from the moment you walk through our doors to give you a beautiful smile. We make visiting the dentist FUN for your kids! The Gentle Dentist's Smile Club is our way of helping our youngest patients (and their parents) take care of their smiles! We work to meet the needs of busy families like yours, from flexible scheduling to a comfortable setting that includes a special Children's Playroom Waiting Area. Our goal is to help your child develop healthy dental practices at an early age by making going to the dentist fun! See how our child-friendly dental techniques make The Gentle Dentist a place your child looks forward to visiting. Welcome to Our Office Virtual Tour! We make your dentist appointments comfortable with our welcoming office environment and friendly staff, and make it easy with our convenient office hours. We offer more available appointment times than any other dental practice in Central Ohio, including evenings and Saturdays. And our staff stays on schedule to the minute to make sure you're never kept waiting.